All these information is my own experiments and thoughts. The spring mechanism continues to interest me and it is very advanced. The possibility to open all the functions at the same time or hold all the functions in an open position that will put maximal strain on the spring. There is pressure in a Swiss Army knife and on the internet you can find some information on this. This pressure can be very high. I did experiment and I did feel this pressure from the spring when all functions was in this maximal position. For me the notch to prevent accidental closing did put very much strain on the system. The spring hurt. The precision in a SAK is very high and it is in the Victorinox philosophy that the knife is always in the elastic region. To open all the functions at the same time is in their philosophy. One should never leave the functions over time in these positions. This is why as a collector i always only open a few functions fully when cleaning and so on. This is only to be gentler on the mechanism like I explained before. For me there is a special interest with the floating spring and its three functions because this is the evidence of a SAK. For me there is a link between the rivet for the awl and the center rivet for the floating spring. The precision of the orbit for the notch in the flat screwdriver is important. The spring on this layer is a very multifunction spring. Like i explained when i clean a SAK i open only a few functions fully this meaning not in the half way position but fully locked out. It is my understanding that opening all the functions at the same time or hold the half way position will put maximal strain on the spring. It is much better i believe to open all the functions fully out(locked out) if you need to do so cleaning the knife.Usually it is only for picture purpose to open all the functions in the area that will put maximal strain. This to show the functions and so on. When i clean a SAK and lock out fully a few functions it is important to move one function at the time from locked out position to closed position. Doing so the dirt and sand will be cleaned from the mechanism. It is absolutely not dangerous to move one function back and forth. Again it is only as a safety precaution i recommend to be careful opening all the functions at the same time. Doing so if you receive a older or hard used knife that may have damages you will not damage it further. 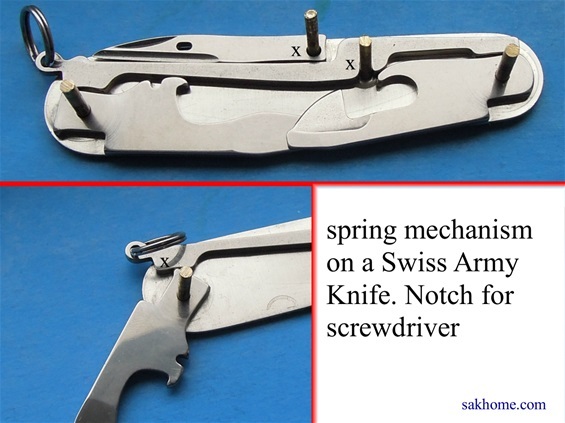 Maintenance on a Swiss Army knife is in my mind needed for several reasons and also in my mind it is needed to make sure that the mechanism is free and then the functionality will be best. Dirt and substances gums up the mechanism and it will prevent the function to open and close correct. Maintenance is needed to prevent damage on the SAK.